Admiral Sir James Francis Perowne KBE is a former Royal Navy officer who served as Deputy Supreme Allied Commander Atlantic. Educated at Sherborne School and the Royal Naval College, Dartmouth, Perowne joined the Royal Navy in 1969. He was given command of the submarine HMS Opportune in 1976, the submarine HMS Superb in 1981 and the frigate HMS Boxer in 1986. 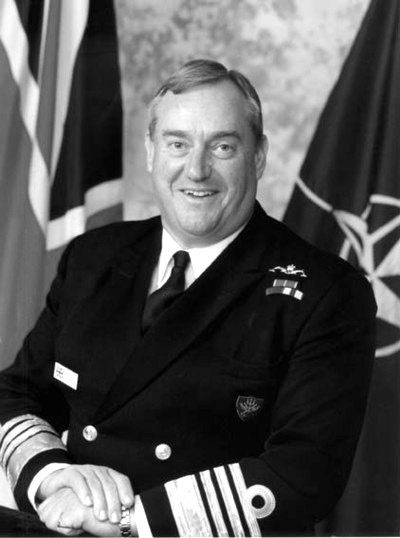 He went on to be Commander of the 2nd Submarine Squadron in 1990, Commanding Officer of the frigate HMS Norfolk as well as Captain of the 9th Frigate Squadron in 1992 and Commanding Officer of the frigate HMS Norfolk as well as Captain of the 6th Frigate Squadron in 1993. He then became Senior Naval Member on the Directing Staff at the Royal College of Defence Studies in 1995, Commander Operations and Flag officer Submarines in 1996 and Deputy Supreme Allied Commander Atlantic in 1998. He retired in 2002. In retirement he became Chairman of the Council of the British Red Cross Queen Mother Memorial Fund and Chairman of the Central Region of the Consumer Council for Water. Sir James Perowne KB took over the Chairmanship of the James Caird Society in November 2006. In 2014 he became Constable and Governor of Windsor Castle.